Coat-of-arms, collection of the artist. I met with fine artist József Szolnoki last Monday evening to discuss some of his works that deal with history and cultural identity, which as it happens, includes probably all his work. Working primarily in film and often in a documentary style, he frames narrative around beliefs about collective or cultural identities that may be more mythic than real. However his approach also includes research, actions, performances, and archives of sorts. Sitting down with his laptop, he told me about four projects that are representative of how he works as an artist: Leptinotarsa, Pannonian Hill, Hallo, and ongoing research into coats-of-arms. 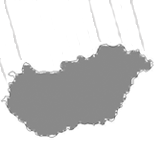 He began with an early work, the 1997 film Leptinotarsa, or private investigative material to the mysterious appearance of the potato beetle in Hungary (Leptinotarsa, avagy privát nyomozati anyag a krumplibogár titokzatos feltűnéséről Magyarországon), which takes as its source point Soviet propaganda about the appearance of an American potato beetle on Hungarian soil. This alleged biological warfare is considered through archival footage as well as new footage of the village where this occurred. At the same time, Szolnoki created (in collaboration with M. Buzás, L. Csáki, M. Maráczi, T. Zsédely) a bronze statue of the infamous potato beetle, which remains a pest in Hungary today. 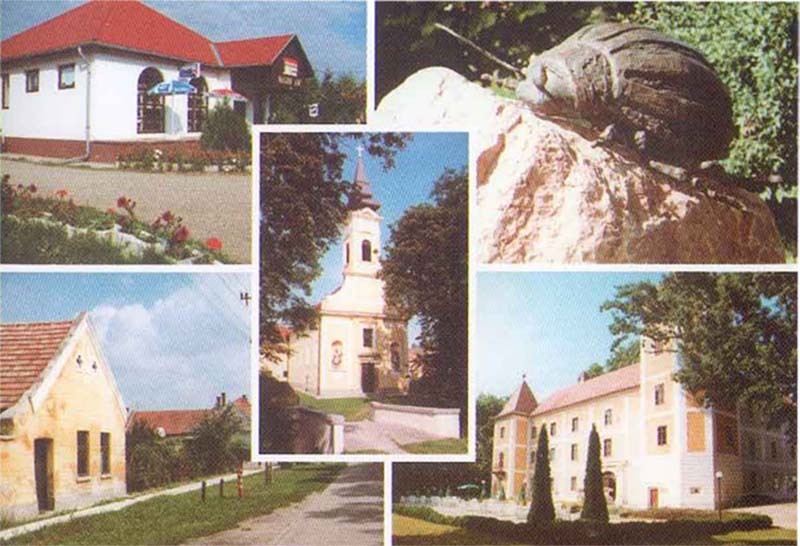 Interestingly, the film has since gained something of a cult status and images of the beetle statue appear on postcards for the village of Hédérvar today. While the film explores the tension between the propaganda and the facts as they are known today, the investigation does not offer an answer to the mysterious appearance. The 1999 film Pannonian Hill (Pannon halom) features the notably religious residents of a Hungarian village who, perhaps misinformed by media about solar eclipse and a comet, take a light in the sky at night as sign that the apocalypse is coming imminently. The footage was shot by Szolnoki, but heavily processed—at some parts more than others—to resemble archival footage. Here there is the recreation of a mysterious event through testimonies, as well as the exploration of an alternative set of beliefs. Szolnoki explained how his 2010 short film Hallo synthesizes the approach he used in both of the earlier films, combining archival imagery and multiple sources to trace the evolution of a mysterious and disputed cultural legacy: the word ‘hello.’ Szolnoki considers the origins of the common greeting, as well as noting how it was first spoken as a Hungarian word on the telephone. Each language has its own etymology for hello that appropriates this now-universal greeting as coming from its own language. Interestingly, while the conceptual approach is a synthesis, the visual style differs from the previous films in that it relies on animation instead of documentary or found footage. The graphics are in the style of the source material: old typeset pages and dated black-and-white graphics which Szolnoki refers to for the various etymologies. Ending this ‘expose’ of sorts with the tag “It is well known that opinions on the matter differ,” one is left with intriguing possibilities rather than definite answers. 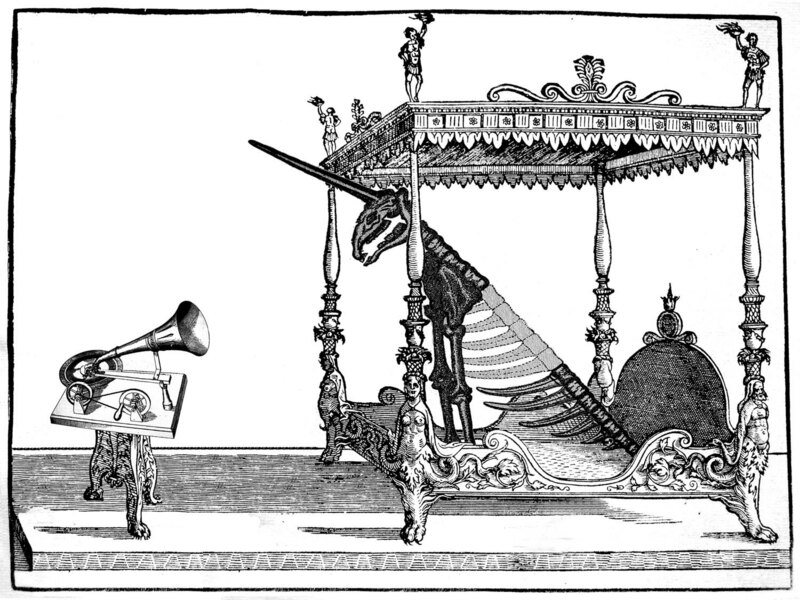 Does the laughing dinosaur at the end suggest skepticism, or perhaps just whimsy? Coats-of-arms, collection of the artist. 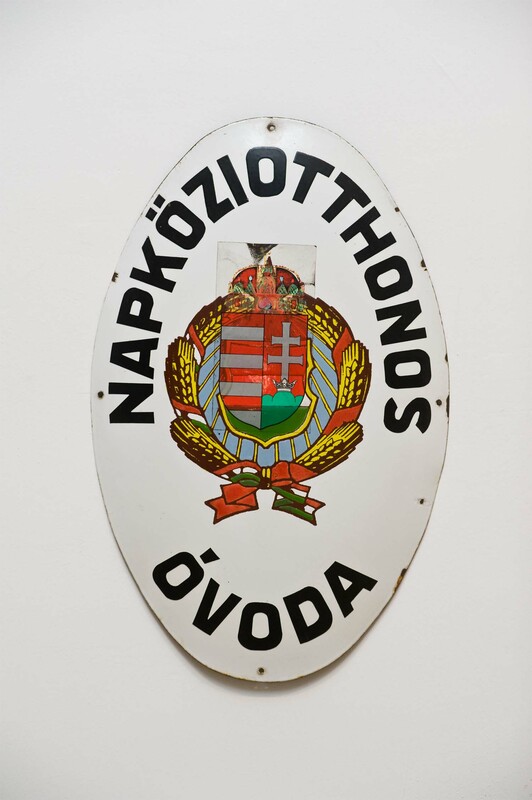 Lastly, Szolnoki explained a current project involving coats-of-arms, some of which he displayed in the 2011 exhibition Homeopathic Reality at the Ernst Museum. 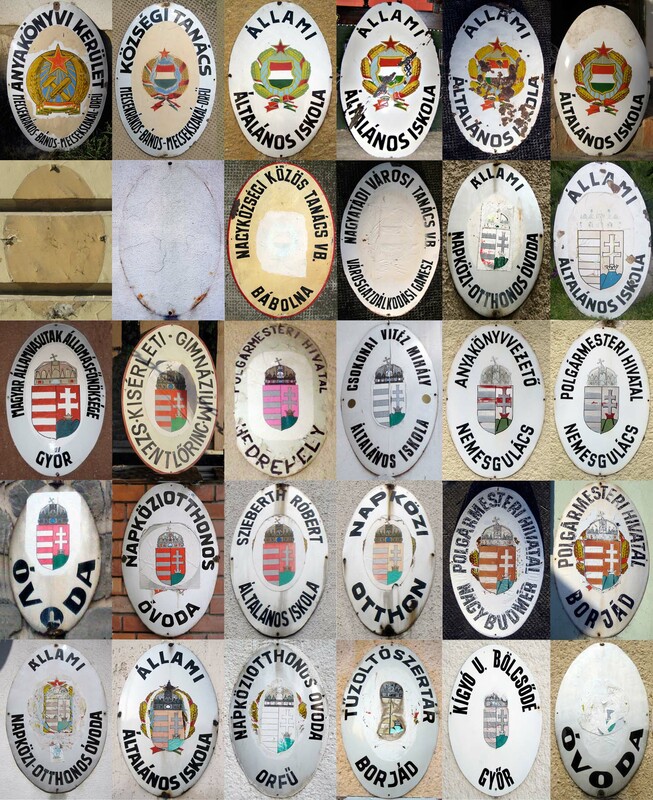 What inspired him are the coats-of-arms on various buildings in Hungary—from cultural institutions to government centers to kindergartens—and how instead of being replaced in each successive government change, sometimes the old crest is merely painted over. When the paint peels, the past is revealed. He is collecting such painted-over coats-of-arms, showing the physical traces of the past which are visible in a way he likens to palimpsest. Other objects that bring the traces of the past into view are also part of this archive he is creating—such as books or pins. Bringing them together draws attention to them and asks for their reconsideration as objects—the artist suggests it is a psychological tick of society not to be able to see such visible permutations of history. Although I hadn’t yet seen the subtitled version, I also wanted to discuss his film One Time Hun, Always Hun (Hun volt, Hun nem volt, 2009) which I initially came across at the What is Hungarian? 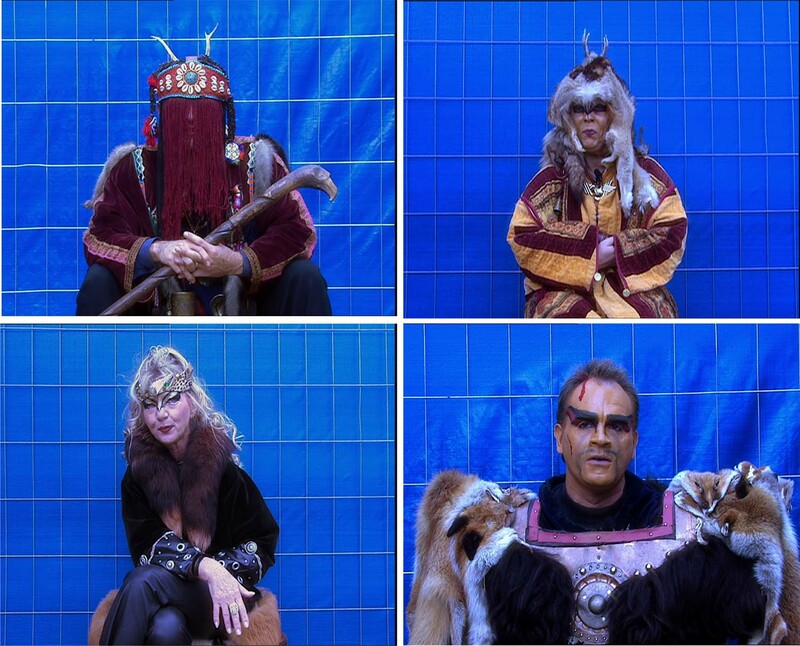 show at the Kunsthalle in September. This more recent documentary considers the origin of an origin myth of the Hungarian people, through a group of Germans and Hungarian who take their supposed descent from the Huns very seriously. While researching a group of Huns in Cologne for a project, Szolnoki became aware that a similar group of Hungarians raised a motion in Parliament asking that the Huns be considered an official minority. From the notion that Huns were aliens to a consideration of archaeological remains and linguistic work, multiple theories and viewpoints about the origin and disappearance of the Huns are brought forward in the film. 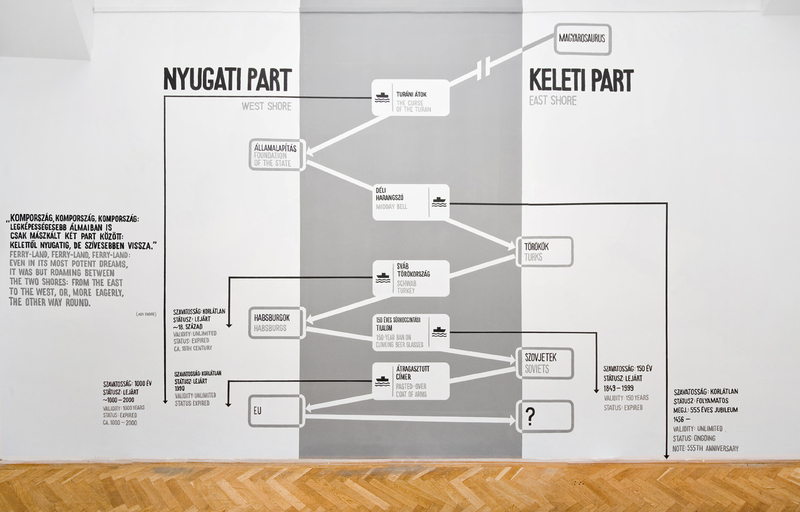 In an extension of the project, Szolnoki brought a Cologne “Hun” to the Kunsthalle as part of his 2009 exhibition Huniversum. 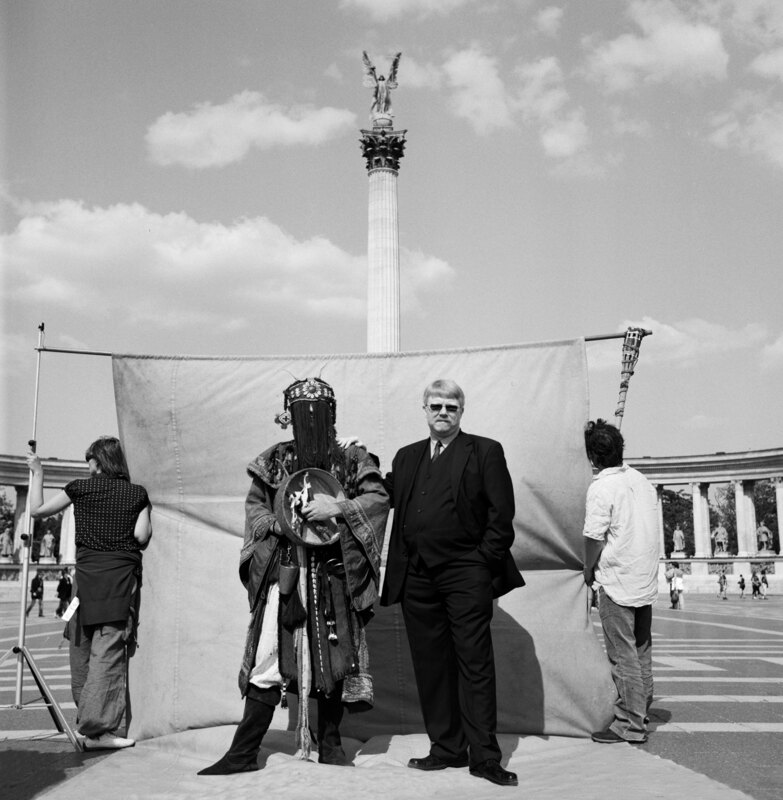 The action included this shaman Hun from Cologne, dressed in elaborate costume, standing in Hero’s Square in Budapest, where tourists could take pictures with him. In the photograph below, a Hungarian who argued for the inclusion of Huns as an ethnic minority in Hungary takes a picture with the shaman. Overall, Szolnoki takes a long view of history. While the history is often complex and contradictory, his more recent projects often offer a streamlined version of history that is emblematic of the key features that interest him. Szolnoki often presents the manifestations of cultural change as metaphors for large cultural shifts. This was evident in Homeopathic Reality, which ended with a symbolic question not toward the past, but toward the future. This entry was posted on May 14, 2013 by linnea8 in Artist Meeting.